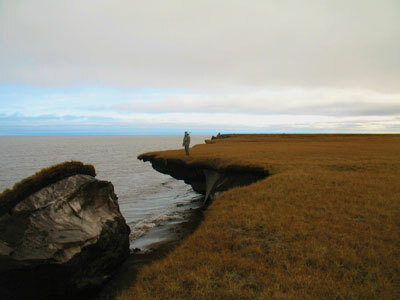 A large chunk of frozen soil—permafrost—in the Antarctic polar region that melted and detached from the land mass as a result of warming climate. Scientists monitoring carbon dioxide (CO2) in the atmosphere announced May 9 that levels of CO2had reached 400 parts per million (ppm). The measurements were taken at the Mauna Loa Observatory in Hawaii. CO2 levels haven’t been this high for at least 3 million years. CO2 is the predominant gas contributing to the “greenhouse effect”—warming the planet and bringing increasingly destructive climate change. It’s produced by the burning of fossil fuels (like oil and coal) and by deforestation, which are central to the functioning of the global economy under capitalism-imperialism. In just the past 200+ years of industrialization, the amount CO2 has gone from around 280 ppm to its present level of 400 ppm. This announcement should serve as a gut punch and a ringing wake-up call about the heightening emergency humanity is facing due to the warming of the planet, climate change, and the overall environmental destruction ravaging Earth. This announcement should shake people to their core. It should make them stand up and shout to others that we must do something—we must come into the streets; we must stop this. Not because the exact number 400 means more in itself than 399 or 401—but because this number, and the rate of increase of CO2, is a very dire indication that the planet’s climate is being taken to dangerous places not previously seen in all of human history. Each year, the world’s big carbon polluters and dominant powers gather at international conferences and talk about climate change and its awful dangers. Each year, they agree something must be done, and then continue to do nothing of real substance to stop this. Instead, they race more aggressively to grab up new, more extreme and polluting sources of fossil fuels in their mad dash to outcompete each other for profits and control. And the planet warms—the Arctic ice cap melts, drought and starvation are worsened, and thousands more die in extreme weather events fueled by climate change. And who is the biggest contributor to the historic buildup of greenhouse gasses, and who continues to do the most to sabotage any meaningful changes? The U.S. leads the pack. That the atmosphere’s CO2 is at 400 ppm and rising is a howling outrage. Where are the calls and the actions to stop the drilling, digging, and burning of fossil fuels that are wrecking the environment and the future? Nowhere to be seen from those in power. Instead of seizing on this as an urgent moment to awaken and mobilize humanity, to stop fossil fuel burning, and bring forward safe energy technologies, the 400 ppm announcement is being treated by the powers-that-be and the mainstream media as one more piece of bad news, to be marked and moved on from. Every year since 1958—when measurements began at Mauna Loa—CO2 levels have increased. 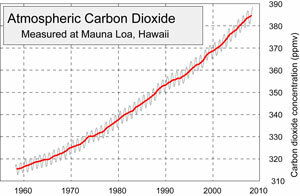 The measurements are displayed in a chart called the “Keeling curve” (see graphic). In 1958, CO2 was at 316 ppm. The increase from then till now looks like the teeth of a saw angled up—each spring the level is highest, it goes down in the summer as plants in the Northern Hemisphere absorb CO2, and next spring it’s higher yet. In 2012, CO2 emissions increased by 2.6 percent over 2011—a new record amount of yearly emissions. CO2 is the predominant greenhouse gas building up in the atmosphere and warming the earth. CO2, methane, water vapor, and some other greenhouse gasses occur naturally, and in a basic way they serve to keep the earth warm enough for life to exist—for plants and animals to live. Greenhouse gasses mainly allow visible sunlight to pass through them. When sunlight hits the earth, much of it is absorbed, but some of this energy is converted to heat that gives off longer wavelength infrared radiation that is reflected back into the atmosphere. Some of this heat radiation is partially absorbed by greenhouse gasses, which trap this radiation like a greenhouse, warm it, and send heat radiation back to the earth’s surface, further warming the earth. Since the start of the industrial age, the amount of greenhouse gasses in the atmosphere have been building up and causing increased warming. Greenhouse gasses are produced by the burning of coal, oil, and gas, by the cutting down and burning of forests and wood, by large-scale industrial agriculture, and other means. Humanity and earth’s ecosystems—the webs of interacting life we depend on for our own existence—are facing a multi-dimensional environmental emergency. Forests and natural habitats are being destroyed and degraded; large numbers of species are being driven to extinction or threatened with extinction; water, air, and soils are being polluted and degraded. And because so much carbon has been spewed endlessly into the skies, the oceans’ chemistry is being toxically transformed by sucking up that carbon. Interacting with, and as a leading edge of, this destruction, climate change threatens to become unstoppable and runaway. In the last 12 months, we have seen the unprecedented scope and destruction of super-storm Sandy and many more extreme weather disasters—what used to be called anomalies—that have become the new normal. We’ve seen the droughts and wildfires of last summer in the U.S. and Russia in 2010, and the massive and unprecedented flooding in Pakistan in 2011. Before our eyes, Arctic ice and glaciers are disappearing. This global melt has immense ramifications for the world climate, for rich ecosystems, and for the water needs of huge segments of humanity. Scientists say that we must turn away quickly from the massive burning of fossil fuels and transition to sustainable, non-carbon-based energy production if there is to be hope for any chance at stabilizing the climate. Most scientific experts say to avoid even more, and faster, disastrous climate change, world temperatures must be kept to no more than a 2-degree Celsius (3.6 degrees Fahrenheit) rise over temperatures of pre-industrial times. But even this may be too high, as we are already seeing huge changes with only the 0.8-degree Celsius temperature rise that has already occurred. Climate change is taking an immense toll on humanity in many ways, but one of the most destructive is the impact on food supplies caused by increasing drought and extreme weather disasters. Recent studies indicate global warming played a part in the 2011 drought in Somalia that resulted in the deaths of 50,000-100,000 people. Food experts are predicting extreme and dire consequences for world food supplies from the heightening effects of climate change. The lives of potentially billions of people hang in the balance in all of this, including the ability to continue to survive in whole regions of Africa, Australia, on island and low-lying nations—like Bangladesh (due to sea-level rise) and other parts of the world. These impacts of climate change are already, and will increasingly be, the most severe for masses of people in the poor countries oppressed by the powerful capitalist-imperialist world. Humans exist on the basis of and in interaction with healthy, functioning, and diverse ecosystems. We rely on these ecosystems for air to breathe, water to drink, food, medicine, and natural recreation and appreciation. Without healthy, functioning, and sufficiently diverse ecosystems, humans as a species will not be long for this planet. The reality is that a fundamentally and radically different world is possible. We confront the need for a completely different way of producing energy, running our economies, and interacting with nature—a way that capitalism has proven repeatedly incapable of doing or even seriously addressing. This is one indication at least that some of the worst impacts of climate change on causing species extinction may still be possible to prevent, or at least limit. But to do this, we must seize on this news of 400 ppm to wake people, to move humanity to resist all this starting now, and to increasingly connect this with the broader movement for revolution, which also must grow and impact all of society. 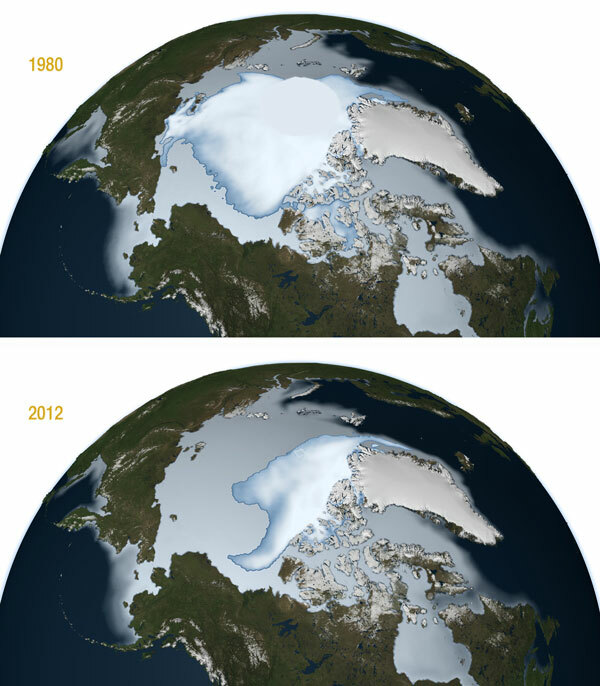 The Arctic ice cap in 1980 (above) and last year (below).